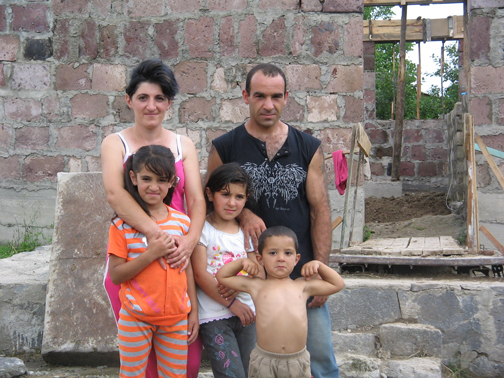 The Ghazaryan family of Dsegh Village in the Lori Region of Armenia has joined the list of international families who will have a house dedicated for them during the 2011 Millard Fuller Legacy Build. Including the eight new homes and eight repaired homes to be dedicated at the host site of Minden, La., at least 100 homes worldwide will be dedicated during the week of Oct. 17-21, including in such countries as Sri Lanka, Nigeria, India and Armenia. The Ghazaryan family consists of Karen, 32; his wife Vardush, 33; daughters Siramarg, 10, and Suzanna, 7; and son Suren, 3. They’ve been living off and on in various relatives’ homes and applied for help from The Fuller Center for Housing Armenia in finishing a home started by Vardush’s father. Karen is a carpenter at a wood manufacturing factory in the village, and the family also farms, including growing fruits and vegetables. The Fuller Center welcomes the partnership of the Ghazaryans and many other hard-working, deserving families who will know the joy of having a simple, decent place to call home during the Legacy Build. Click here to get involved with the 2011 Millard Fuller Legacy Build. Learn about the very first international family, also from Armenia, picked for the Legacy Build. View the wonderful video below about our very active work in Armenia.